This was one of my very favorite cakes to make. It's right up there with my Kit Kat Cake that I made for my son's 16th Birthday. I made this cake for my daughter's birthday a few weeks ago. My cousin sent me a picture of a variation of this cake (ombre) and I knew I had to try making one myself. I mean really, who doesn't love rainbows? And look how gorgeous the colors came out! I used my new Americolor soft gel paste food colors and they are amazing in the vibrancy you get! I would definitely make this cake again but would try it in 8 inch pans instead of 9 inch pans. I think the layers were a little skinny so the cake ended up slouching a little BUT it didn't make one bit of difference on the flavor or spectacularity of the cake! Don't you agree? Pre-heat oven to 350 degrees. Line two 8 or 9 inch round baking pan with a circle of parchment and then spray liberally with cooking spray. Set aside. While the cakes are cooking separate the M&M's into bowls (or enlist your kiddos to do this fun job) Notice how there is WAY more blue and orange than any other color? Weird! In the bowl of a stand mixer place one cake mix and the ingredients off the back of the box to make the cake and beat on medium for 2 minutes until fluffy. Scrape down the sides as you go. Pour evenly into three bowls and add several (5-7) drops of gel food paste coloring. Stir until all the color is absorbed. If needed add a few more drops to get the color you want. Pour into the pre-lined and sprayed baking pans (I only have two so I baked them two at a time, but with the super quick baking time it was fine). Bake for 10 - 12 minutes or until a toothpick inserted into the middle comes out clean. Cool for a couple of minutes in the baking pan then remove to a cooling rack. After all the cakes are made and cooled make the frosting. I made it in two batches, first a full batch then I needed another 1/2 batch to finish the top and sides. Cream the butter and cream cheese in the bowl of a stand mixer or large mixing bowl. Next add the powdered sugar and VERY SLOWLY turn on the mixer until it is mostly incorporated then you can add the vanilla and start adding the cream 1 Tablespoon at a time until it is the consistency you like. **note ~ I add the cream cheese because I feel it gives the frosting a richer taste and is never grainy like some buttercreams. Before you start cut any bumps or puffy spots off the cake using a serrated knife to make the cake as flat as possible. Scoop a large dollop of frosting and place it in the center of the cake. Spread out to the edges. If you are using a 9 inch like I did you might want to make the frosting at the edges a little thicker so the layers are perfectly even and don't slouch. Keep layering the cake until you have all the layers on straight and then frost the top and around the sides. I used liberal amounts of frosting to keep the cake from getting crumbs in the frosting. 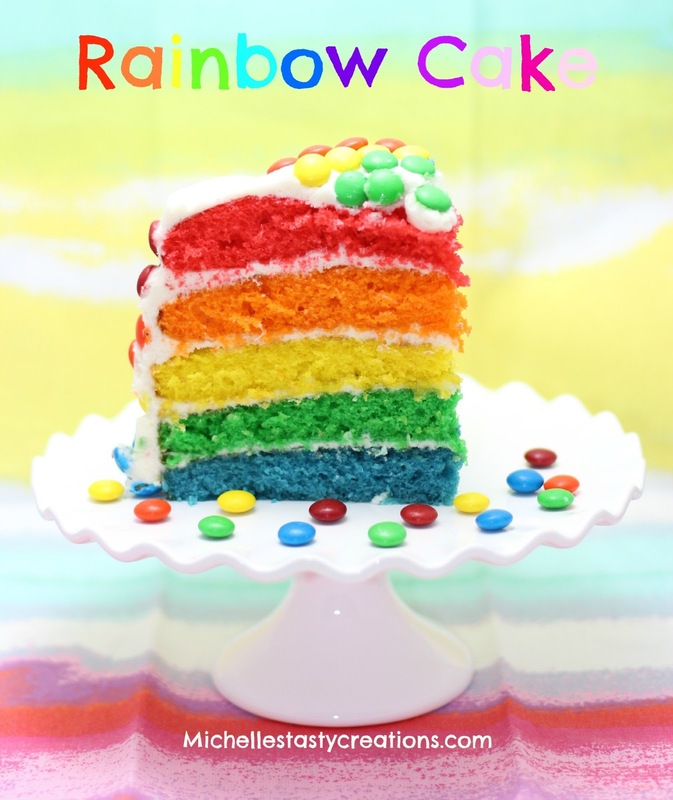 Next, PATIENTLY start at the top and go around the whole cake with M&M's to make a rainbow look. As you can see, I started with two rows of each color and ended up with only one so there was enough room for all the colors. If I had used my math skills I probably could have figured this out BEFORE I started, lol. And HAVE FUN WITH IT! This was a fun cake to make and if I've said it once I've said it a thousand times "I LOVE BOXED CAKE MIX"! They are easy to prepare, light in texture and ALWAYS turn out perfect! NOTE ~ There wasn't enough of some of the colors to make two rows of M&M's on the whole cake so try and figure out how many you need before you start. If you can find them in a store sold in individual colors this would be perfect! Please share your lovely cake at Pin It Monday Hop Where you pin and get pinned (LINK). You can share up to 4 post. We are also giving away an Ipad Mini. If you get a chance, I'd love for you to stop by and join us. I hope to see you there. I like this cake. The colors are wonderful. I am sure your daughter loved it for her birthday. Wow, that turned out SO bright and colorful!! FUN!!! Eva, I know I love my new Americolor Gels! It's such a wonderful cake. It's fun to make it and everyone just loves it. I think you did a great job - your cake looks amazing! That is so gorgeous - it makes me giggle to think of getting to eat it. OH MY! What a beautiful creation...made with love for sure. I made similar to this last year for Leap Year Day. It was fun to make and everybody thought it was cute. It's a lot of cake!